Every village has many temples, and once in every 15 years, the members of that village have a celebration to cleanse the biggest, most important temple, and make offers to God, and today was the day! 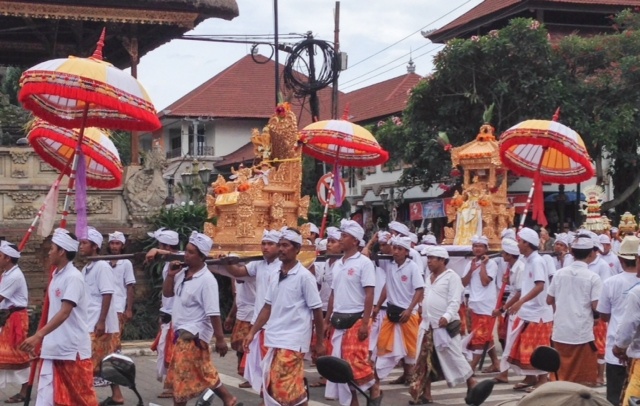 This is done by every separate village all over Bali, but it is up to the village to determine the timing. I was trying to tie it to a date on the calendar, as in “is this celebration on an anniversary, or is it New Years?”, but that made it even more confusing when they told me that Bali has an entirely different calendar than the rest of the world, that there are only 10 months in a year, so scratch that. 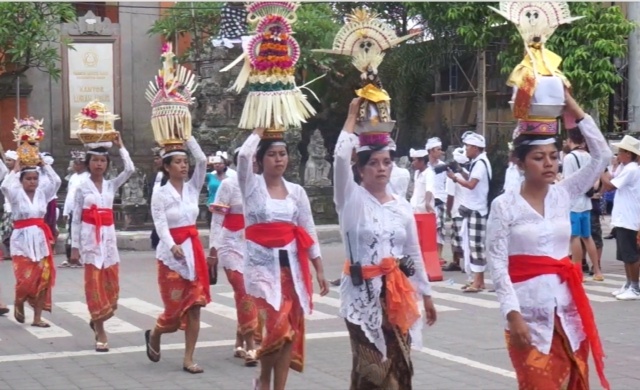 The entire village dresses in white (for celebrations), and they take all the sacred artifacts from the temple out for a cleansing and to make offerings to God. It involves something to do with walking to the beach, a symbolic cleaning, a walk back to the temple, then a long celebration at the temple. Every storefront decorates with a huge bamboo pole intricately sculpted with a food offering of rice and fruits to God to give thanks, and these beautifully line both sides of the street.In America, when there is a parade, people often sleep overnight on the sidewalk to make sure they get a good viewing spot. It was a little different here…if you were a tourist, you’d be on the curb, if you’re a village resident, you’re IN the parade, so getting a good viewing spot wasn’t too difficult. LOL!We couldn’t tell what time this was all going to happen. Nobody really knew. 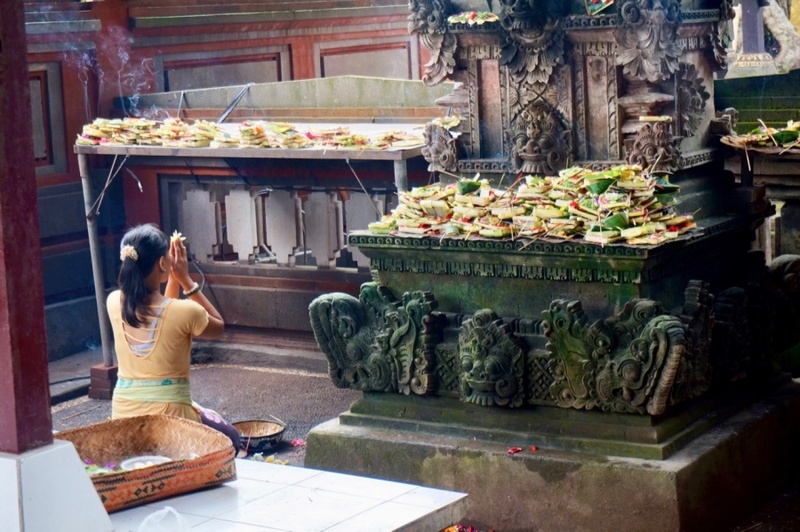 Apparently timing has something to do man’s relationship to God, nature, and the animals…The Balinese certainly run on a different clock than Americans. We waited for two hours, but we were in the right place at the right time when it finally happened. It only lasted for about 15 minutes, but it was worth the wait. It was like a scene out of a Cecil B. DeMille Bible movie where Charlton Heston was about to show up from climbing down from the mountain after talking to God. 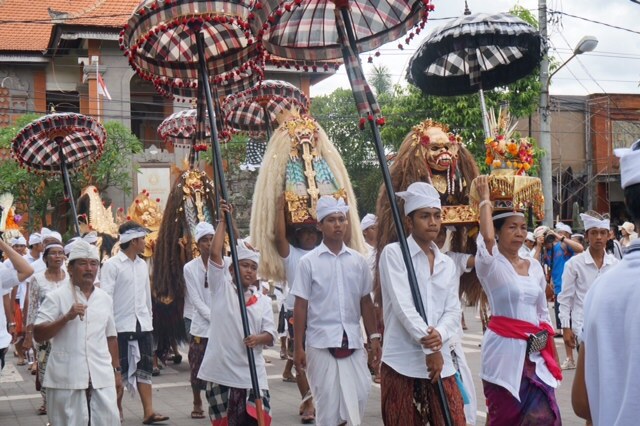 What’s amazing is when you realize this is not some show put on for tourists, it is authentic, Bali life. You won’t be able to get photos like these unless you go to another village, catch them on the right day, or wait another 15 years. 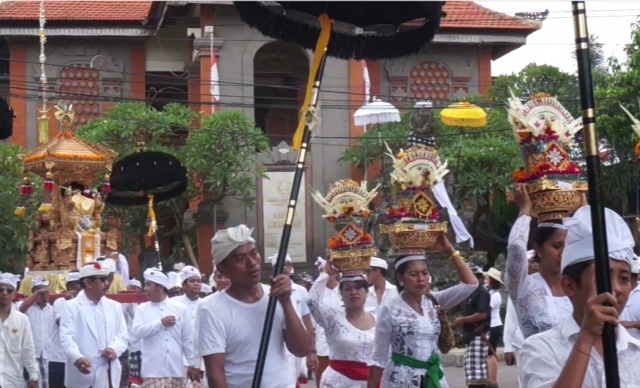 On the other hand, our driver told us, Balinese people are always celebrating something. Keep your white outfits handy. We leave tomorrow for Singapore, so we must bid farewell for now to this colorful, enchanting corner of the world. It does seem like a page out of some bygone era, and I hope this place does not lose its charm as time marches on.